A university faculty building in Milan by Irish practice Grafton Architects has been named World Building of the Year at the inaugural World Architecture Festival, held in Barcelona last week. Luigi Bocconi University was praised as a "magical subterranean realm" by judges including Robert Stern, Richard Burdett and Cecil Balmond. The new faculty building at Luigi Bocconi University, Milan, designed by Irish practice Grafton Architects, has become the first World Building of the Year at the inaugural World Architecture Festival Awards (WAF Awards) 2008, at the Centre Convencions International in Barcelona. The judges praised the architects who, though not from Milan, succeeded in distilling the essence of the city into a confident, contemporary form. The building includes offices for 1,000 professors, 5 conference halls, lecture theatres, courtyards and concourses, all accessible to the public, with offices for teaching staff suspended above. The WAF Awards are biggest architectural awards programme in the world, designed to celebrate the work, concerns and aspirations of the international architectural community. Luigi Bocconi was selected by a super-jury chaired by Robert Stern, Dean of Yale School of Architecture, which included Cecil Balmond, Deputy Chairman of Ove Arup & Partners, Richard Burdett, Centennial Professor in Architecture and Urbanism at the London School of Economics, and Suha Ozkan of the XXI Architecture Centre, Ankara. They selected the project from a total of 17 finalists, whittled down from a shortlist of 224 projects that were presented during World Architecture Festival between the 22nd and 24th October. World Architecture Festival, organised by Emap is one of the most significant dates in the global architectural calendar. It is the biggest architectural event in the world, which looks beyond borders to celebrate the finest work from the world’s greatest architects. We saw this brief as an opportunity for the Luigi Bocconi University to make a space at the scale of the city. To this end we have built at the scale of the site,80m x160m. Inside, our building is thought of as a large market hall or place of exchange. The Building’s hall acts as a filter between the city and the university. The northern edge of the site fronts onto the artery of Viale Bligny, with the clatter of trams, the rush of busses, general traffic, people passing. It addresses the throbbing urban life of Milan, weaves into the mesh of the city. 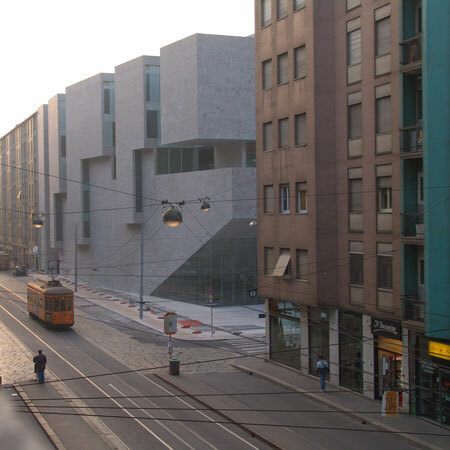 This frontage becomes the architectural opportunity to have a ‘window’ to Milan, a memorable image to confirm the important cultural contribution that the Bocconi University plays in the life of this city. For this reason, the public space of the aula magna occupies this frontage, asserting a symbolic presence and a register of the prestigious status of the University. The building is set back from the Viale Bligny & Via Roentgen edges to make a public space 18m x 90m inspired by the space forward of Hospital Maggiore.This new deep ‘finger’ of space reaches out to the city and beckons the visitor into the heart of the interior. This public space continues into the building, bringing with it it’s stone surface, the floor of the city. In order to make this grand place of exchange we thought about the research offices as beams of space, suspended to form a grand canopy which filters light to all levels. The offices form an inhabited roofscape. This floating canopy allows the space of the city to overlap with the life of the university. Allows internal and external public spaces to merge. The underground accommodation is treated as an erupting landscape which offers support to the inhabited light filters above. Spatially this underground world is solid, dense and carved. We tried to establish a continuity between the ‘landscape’ of the city and the ‘made landscape’ of this undercroft. The external wall to the sunken Aula Magna reaches the full height of the building with the upper level offices inhabiting it’s roofscape /attic. The full bulk and scale of this great room ‘the embedded boulder’ sits directly on the street edge and is the anchor for the totality of the building.